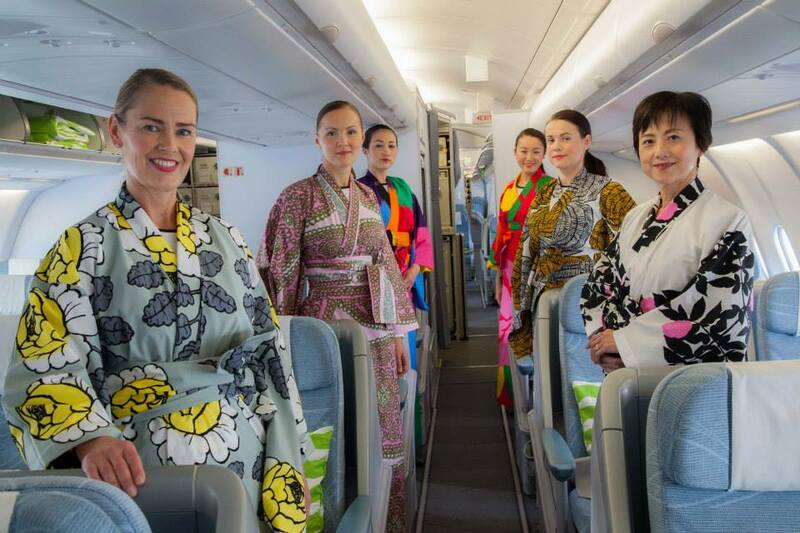 If you have been travelling recently on our favourite Finnish airline to Japan over the past couple of weeks you may have seen a myriad of Kimonos adorning the cabin crew designed by none-other than Marimekko. The reason? To celebrate the Japanese Cherry Blossom “Sakura”, a season in Japan that brings in a huge influx of visitors. For a three week period (ending April 16th) up to three kimonos will be worn per flight during the boarding process and whilst the cabin crew perform their duty free sales service. Marimekko has been working with Finnair for the past two years, helping create iconic soft furnishings, liveries and service items, but this is the first time they have expanded into a uniform partnership. In total, Marimekko have created 14 different prints for the Kimonos and each one of the designs feature colourful patterns that are inspired from some of nature’s most spectacular flora and fauna elements. We absolutely love these Kimonos, and hope they will become an annual affair. Finnair have also celebrated “Sakura” with special Sakura menus with a Sakura menu card in Business Class while in Economy Class Sakura noodles and dessert replaced the standard menu items. Recently we announced that Finnair has celebrated 90 years since the airline’s first commercial flight. In 1924, a Junkers F13 seaplane took postal mail from Katajanokka in Helsinki to Tallinn, Estonia. This latest Marimekko venture, just shows the airline still knows how to celebrate in style. And with 3 days still left, perhaps now is the time to book a last minute flight to Tokyo and become a piece of Finnair history for yourself. As part Japanese, I love the Finnish design play on the Japanese kimono…but some of the patterns are a bit intense. There is a balance between nice and fugly.